Like clockwork, here’s Mike’s fashion closet. Some readers have commented that it’s kind of weird to think of Mike wearing things that aren’t either his original black t-shirt or the Shortpacked! uniform. I agree! Well, I agreed more about a year ago, before I started giving Mike some other things to wear, here and there. For example, above’s dark gray tee over the black-sleeved shirt is something I introduced in Shortpacked!‘s “This Man, this Manhattan” storyline just out of sheer necessity, since, well, he needed a change of clothes. Since then, it’s been easier. Mike wears browns, blacks, and grays. Not so hard, huh? Just had to break the ice. I imagine Mike also has a collection of t-shirts that would make people mad, in certain company. He loves to wear his “Twilight” shirt to the local comic book store, for example. Feel free to brainstorm your own. Han Shot First around Star Trek fans, and Live Long and Prosper among Star Wars fans. Or “Greedo Shot First” around the Star Wars fans. You can keep your Han and Greedo, I know exactly how it goes. Hahaha. The Purdue jacket is a nice touch. 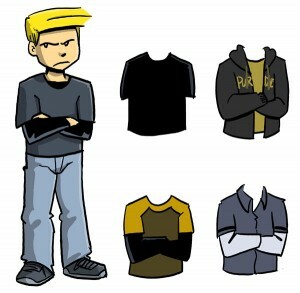 Heh, not only the Purdue jacket but the bottom right also has Purdue colors. Wait…do you mean bottom left, or does the Purdue jacket not actually have the Purdue colours on it? I’m not too familiar with Indiana athletic rivalries, but considering this is Mike, I’m guessing that that Purdue hoodie will piss a lot of people off pretty much everywhere on campus. I’m surprised he’s not wearing it now, actually. He’s probably saving it for the football game. I still support my motion that Mike is one of the original Thirteen and the same entity of spite in each universe out there. We could pretend Dead End is a Mike Prime toy, and say that Unicron is actually HIS MINI-CON named ‘Yourmom’. Superman T-shirt for wearing around descendants of Fawcett employees. Robotech shirt at an anime convention. Even though everybody knows Robotech was better. A shirt that says RIRFIB on the front and RIBFIR on the back, to wear at Botcon. Dammit, Willis– I’ve got Dina fanart with Mike wearing a “JESUS CHRISTOPHER HITCHENS DIED OF CANCER FOR YOUR SINS” T-shirt, but it’s only half finished. Also there’s violence. No shirt, when he’s fu— well, we all know what he does by now. I’d imagine he’d have something like that. I’m surprised he doesn’t have that shirt the “Epic Beard Man” (blech) wore. Mike should totally wear one of Joel Watson’s “Edward” shirts. 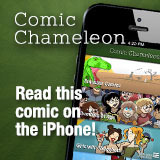 Comic Sans fonts =D Fun for the whole family. Wow, it is super weird to realise Jacob was around when “This Man, This Manhattan” ran. In my head Jacob is still a new addition and Manhattan is an Older Story, but Jacob was there over a year ago! Time flies. Pink shirt with a unicorn on it. I dunno, it just seems very…him. Or, of course, your mom’s shirt. Oo…T-shirts to piss people off…my immediate instinct is to put him in a Mike>Joel shirt, but that was so very long ago and has largely blown over. Have him wear a shirt of Obama, dressed as Jesus, to a Tea Party rally. Fun. In fact, a shirt with any view on it worn to a convention of people with the opposite view would work. Sadly, I cannot think of a shirt that might be overwhelmingly assholish out of any context to suit Mike. So, yeah, sorry. This was the best I could do.